Youngsters in Northland are getting the chance to experience dairy farming first-hand thanks to two Northland farming couples taking part in DairyNZ’s Find a Farmer programme. Creating a link between urban and rural communities and showcasing farming to the next generation are just two reasons why Terence and Suzanne Brocx and William and Robyn Hori host school visits to Puketi Farms in Ohaeawai, just west of the Bay of Islands. In the past, many city families had links to country cousins but that association has now largely been lost. The Brocxs and the Horis say joining DairyNZ’s Find a Farmer service has been their attempt to re-establish the connection. Twice every year, the joint-owners of Puketi Farms host two school visits to their autumn calving farm. Suzanne has been pleased with the results, saying students and accompanying parents and teachers depart knowing at least one new thing about dairy farming and rural life. The visits give children a chance to make their own butter by shaking cream. The hosts also set up a station where children can learn to read ingredient labels and choose everyday items that do and don’t contain dairy products. 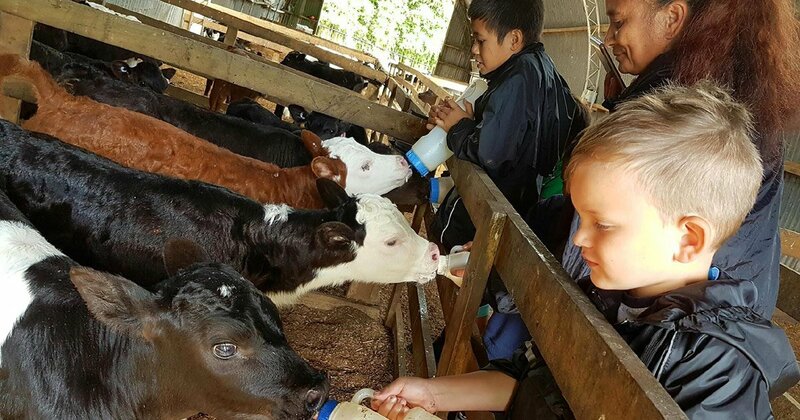 To help educate the children on various aspects of farm life, the Puketi Farms team also sets up four themed stations which the children visit in groups. Puketi Farms has been part of the Rosie Education programme since 2014. The programme, developed by education specialists, is aligned with the New Zealand curriculum and covers Levels 1 to 8 using dairying as a context for learning. It aims to help kids understand where milk comes from and what a varied, interesting, and significant industry dairying is. DairyNZ’s Find a Farmer service connects schools with a local farm. It allows students to experience what they’ve already learnt in class through Rosie’s Education. A field trip is a popular learning experience that reinforces the classroom work.